As gripping as "The Farmer's Wife" is, there is a second, unseen saga behind it. With double the drama. The Boeschkoetters were not the only heroically struggling couple during the three years or so it took to produce the film. Living in the farm country, supervising a crew, shooting hundreds of hours of intricate, sonically, cinematographically and philosophically ambitious footage every day and laboriously reviewing it each night--filmmakers David and Nancy Sutherland were, in a strange way, doppelgangers to the farm couple. Not only documenting their struggle but engaging in a parallel struggle of their own. "You're always constantly adapting," says David. "I had five different camera crews--one guy shot 'Homicide.' Another worked on 'Hoop Dreams.' They all had their own ways of doing things, but it had to be my way. Everybody had to be in sync and to improvise, and then we'd play stuff back at night." While Darrel and Juanita Buschkoetter fought to fulfill their dream of keeping a family farm--and a family--alive in an era when everything from the weather to the economic system collaborate to extinguish it, the Sutherlands attempted to preserve a tradition of long-form, non-narrated documentary filmmaking that is also on the endangered-lifestyles list. The interaction of the two couples makes a fascinating study of the nature of documentary truth, and a deeply moving story of four people bonding in a time of unique crisis. "They were different than we were," says Darrel Buschkoetter with Nebraskan understatement. Adds Juanita: "But towards the end we realized how much we've got in common with them." The Buschkoetters come from a town of 350 in the supremely traditional, heavily Catholic farming heartland. The Sutherlands are from Newton, Massachusetts, a Jewish couple whose religious impulses are channeled into artistic forms of extreme originality. David Sutherland's films are devoted to the idea of change: his subjects range from octogenarian enfant-terrible artists to midlife Yale graduates to blind cowgirls near the California-Oregon border. The Sutherlands' Newton home is festooned with Nancy's bizarrely inspired paintings and sculptures, many of them incorporating bleached bones from animal cadavers taken from the Buschkoetter farm. Yet there are parallels between the two couples. "Two women living their husband's dream," says Nancy Sutherland. Like Juanita, Nancy has learned her husband's business and serves as a full partner in it--in some aspects of the business more skillfully than he. "We're chasing dreams, Darrel and I, and Nancy supports my dream in the same way Juanita does," says David. Both couples live in homes that are the hub of an all-consuming world of work. Once the years of filming were over, the Sutherlands repaired to their Newton basement, where David and coproducer Nancy edited a document that is in some ways more fantastically complex than a feature film. "We don't have 20 people working for us. So all the work--I'm responsible to recreate every frame of sound," says David Sutherland, wild-eyed from weeks of lack of sleep. "There are over half a million audio edits in this, where normally with something like this, you probably have a hundredth as many. Meaning every microphone has to be separated or they echo. Each one of those has to be equalized, each sigh and groan recreated exactly so it can be heard exactly as it was recorded. I'm not looking for sound bites. There are so many elements--I mean, Darrel has so many groans! Every time he gets off the tractor and comes into the house, he has a different groan. He's always hungry to talk about how he feels." 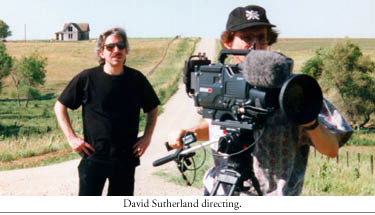 So is David Sutherland, the most technically remote yet emotionally sensitive of filmmakers. He uses his sensitivity to give his subjects a voice--he calls his method "the soliloquy film." Though he's quite capable of making conventional narrator-driven films, his ideal is the film whose images and subjects speak for themselves. The effect of all this effort is an impression of absolute effortlessness, an art of documentary that almost completely obscures the filmmaking process. "The goal really was to feel like you're living in their skin. We want you to know who they really are and so you feel for both of them," says David. Sometimes the filmmakers wound up deeper into the farm life than they'd intended. A sweet-tempered bull took one look at the Bostonians and "went ape," says Juanita. 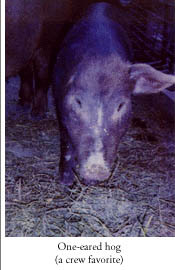 The first scene the crew filmed was in a hog pen, where they discovered to their horror, up to their knees in mud, that hogs are not immobile nor contemplative animals. They're big and they charge in a messy fashion. "They didn't realize the danger," says Darrel. "They thought hogs would be like statues sittin' there. Well, they're not. It didn't take long for them to get out of the pen." "One particular time we were pickin' corn, my brother-in-law haulin' for me. And I was runnin' the combine," recalls Darrel with a grin. "And the cameraman had his tripod set up inside this truck box, filming me." "Which I'm sure made a great scene as far as the angles went," says Juanita. "I didn't realize he was IN the truck," says Darrel. "I just thought he was sitting on the back--I didn't pay attention. Here I am, filling the truck with corn, and I got it full, looked back--and this guy is standing waist-deep in corn, tripod and all. Once you get waist-deep in grain, you cannot get out of there." Concrete would do about as well. The cameraman was in a total beginning-farmer's panic. "We dug and dug and dug and finally broke the webbing on the tripod and finally got him out," says Darrel. "We should have just went to the elevator and dumped him--it would've worked better." The filmmakers' impact on the family was subtler, less traumatic. Farmers cannot afford to be fools and the Buschkoetters were aware of what they were doing inviting the Sutherlands into their lives. "They have an agenda and they care about family farmers. " says David Sutherland. "And they thought they were the only ones who were having trouble with their marriage, and that this might help other farmers in the same troubles. I think they just wanted to have somebody they could trust to tell their story." "So much in the farmer's personality is to be private," says Juanita. "You know, you don't let people know you have problems. As I work the hotline, you realize that as soon as you open your problems, everybody's been there at some point. And they open theirs up too. If you're ready to reach out for help, you're ready to focus and prioritize you can get through your problems okay." Both couples agree that the making of the film was not responsible for exposing the Buschkoetters' troubles. "In a small town, everybody knows 75 percent of your business--the other 25 they make up for you. It's worse than what's real, so what the hell if they know the rest?" Darrel says, laughing. "When we were having some money problems, you know, small town--everybody knew it. And they'd go to your landlord maybe to see if they could take your land away from you because they knew that you were on the brink." Forced to take a last-ditch loan, the Buschkoetters' private woes became public property. "If you get an FMHA loan you live in a fishbowl," says David. "All the records are open to anyone and everybody talks about it." In a way, the tough times when the Buschkoetters feared they might lose their farm helped the film by giving them bigger problems to think about than the microphones on their collars. "What people don't realize is they're in need of money, I mean they're in dire straits," says David Sutherland. At one point, Juanita realized she had approximately sixty-five cents per day to buy groceries for a family of five. "There are six issues they're dealing with before they're even thinking about us." says David Sutherland. "Once they trust us and know that we're not dangerous." "I don't think he ever exploited us," says Juanita. "David told us up front he wanted to get up close and really focus on personal issues and everything. When we agreed to it--who can look into the future and know what you're gonna go through? So that's a little bit hard. But he did what he said he was going to do. And Nancy said to us-- 'When people are going through tough times, you film the tough times.' I really believe that you're better off when you confront things. I'd rather have things out in the open. People wondering what your problems are--that's one of my concerns with both of our in-laws." In some of the most wrenching scenes in the film, Juanita's family speaks acidly of Darrel's farming obsession as a selfish folly that drags Juanita and the kids down with him. And Darrel's father, a hardbitten old farmer who seems incapable of giving his son the slightest crumb of encouragement for a job well done, has some hard words too. ("He's a hurricane!" marvels David Sutherland.) How are Darrel and Juanita's in-laws going to feel when this laundry is aired nationwide? "You know, it doesn't worry me as far as our families are concerned," says Juanita. "I guess I feel if they're ashamed of the way they're acting, they should've been ashamed when they were doing it, not just now 'cause the rest of the country's gonna see it." The Sutherlands strictly resisted the considerable temptation to offer the Buschkoetters any advice or money--partly because they didn't have much to offer. Juanita's family, which includes graduates of Wellesley and Harvard, and no one in financial difficulty, did send money from time to time. But the Sutherlands plowed most of their life savings into the film, with no guarantee whatever that it would ever be sold. Six-hour-plus films about farmers are not in heavy demand on the film-festival circuit, even to somebody who has won many prizes. "Nobody would give me money," says David, referring to the time before Frontline picked up the film. "The way I've been humiliated by HBO--I'm 50 years old, and I've done good films, and all of a sudden, with cable and the prices of documentaries coming down, I'm not one of their chosen people." To hear David bewail falling film-production prices sounds eerily like listening to the Buschkoetters lament the era of $1.50 corn. The Sutherlands know what it's like to lose a life's work in a family business. For years before he turned to filmmaking, David sold tires--often to farmers--and his life savings at that time was poured into his tire store in the Boston area. "Fate stepped in," says Nancy. "The store was hit by lightning." It burned before their eyes. "We were underinsured. I could easily have gone Chapter 11 and left with a pot of money, but I paid all my creditors off." Then the couple took the lightning strike as a divine sign to risk all on a life of documentary filmmaking. That wasn't the last crisis the Sutherlands faced--at one screening of a well-received film, he burst into tears when somebody asked what his next one would be, because he didn't think there was funding for another. Although Sutherland scrupulously avoided directing the events before his cameras, the presence of the Sutherlands' crew inevitably affected the Buschkoetters--evidently for the better. "We would've had a tough time no matter what, and of course our marriage problems came to a head," muses Juanita. "But really, I think the film crews were a good distraction for the kids. One of the sound men in particular, the kids just loved him. He talks like Donald Duck. He taped a whole book in the voice of Donald Duck--imagine what his throat felt like when he got done. It was like having a seven-person team of childcare. And David and Nancy, both of them actually are just big kids at heart." The curious parallel lives of the Sutherlands and the Buschkoetters are perhaps best captured in their relationships to the idea of the house. The farmers were utterly absorbed in the practical matter of keeping their house and land and entire way of life from repossession by creditors. Meanwhile, Nancy Sutherland, the fanciful artist with an imagination as expansive as the Nebraska sky, helped each of the Buschkoetters' three daughters build little models of their own dream houses. And David Sutherland all the while was obsessively photographing the paint on the main farm house, documenting its peeling over the years. "Symbolically you could say the old house is falling down, which I used as a metaphor throughout--it's peeling more and more, but there's a certain beauty about a fading type of America that I fell in love with. I just fell in love with the prairies." In the end, the Buschkoetters prevailed over their problems. They repaid their debtors, repaired their marriage, expanded their farm, and repainted the house. A pair of images stick in David Sutherland's mind. The first is on the front porch of the house, when the Buschkoetters' troubles were in full fury. "Juanita gets a call, and the plug's being pulled on her loan, and she's shaking, and I had to catch a plane, and I felt so bad--what an awful way to leave somebody! And then, four years later, Juanita and Darrel fly to the press tour in Pasadena." They went to help explain the film to the nation's television journalists, and wound up chatting with England's Prince Edward and being stunned by the princely luxury of the Ritz Carlton Hotel. "Having the guys put the tray in and say, 'Good morning, sir,'--I thought, nobody calls me 'sir!' I wouldn't want to have that all the time," says Darrel. "They'd never seen the ocean or been on a plane," says David Sutherland. "And she's standing in the water in Santa Monica and Darrel's standing next to her, and they hand her a cell phone and she's talkin' to their kids--'Can you hear the ocean?' --and she's just chortling and laughing, with a big smile. That they did all this--I'm just in awe, I just can't believe it!" Looking back on it all, perhaps the Buschkoetters feel about the experience of the making of "The Farmer's Wife" the way they did when the plane lifted them out of Nebraska en route to Pasadena. "When we took off, Darrel had this look on his face--'I don't think he's going to make it!'" says Juanita. "And this speed coming off the ground--you realize you're not getting out of this thing you're in," says Darrell. "No, there's no way you're going back!" laughs Juanita. "After a while, I loved it," says Darrel. "Now I look forward to going up there." Juanita says she learned one main lesson from the last rough passage of her life. "The situation doesn't make you a success or a failure. I think you're more of a failure if you don't follow your dream."